Acer announced the first Chromebook laptop with a touchscreen for US$299.99, which is about $100 more than the company's cheapest non-touch model. The C720P Touchscreen Chromebook has an 11.6-inch touchscreen, which displays images at a resolution of 1366 x 768 pixels. The lightweight laptop offers roughly seven-and-a-half hours of battery life and runs on an Intel Celeron 2955U processor based on the Haswell microarchitecture. Chromebooks are laptops for those who do most of their computing on the Web. Chrome OS is mostly adapted for keyboards, but the touchscreen could ease selection of options in menus and improve interaction in browsers and other applications. A new wave of Chromebooks running the latest version of Chrome OS started shipping in October. The laptop will be available in early December through Amazon.com, Best Buy and Acer's online store. The laptop will be available in the U.S., Switzerland, Germany, U.K., France, Netherlands, Russia, Sweden and Finland. 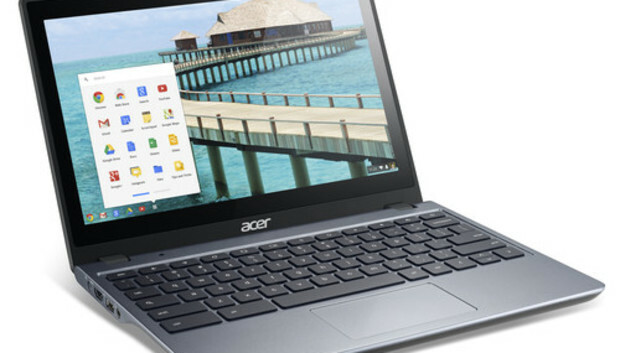 Other Chromebooks include Acer Chromebook C720-2848, which has an Intel processor and is priced at $199.99, and Hewlett-Packard and Google's Chromebook 11, which has an ARM processor and is priced at $279. HP's Chromebook 14 has a 14-inch screen, an Intel processor and is priced at $299 in Office Depot. The C720P weighs 1.35 kilograms and boots in seven seconds. Other features include 32GB of solid-state storage, 2GB of DDR3 memory, USB 3.0 ports, 802.11a/b/g/n Wi-Fi and an HDMI slot. Users will get 100GB of free Google Drive storage for two years with the laptop.